Cornelia Funke came to my hometown of Pittsburgh, Pennsylvania last weekend for an event at our city library. She took an hour and a half out of her busy writing schedule to sit down and chat with me about her books and the worlds she’s created. A lot of what I asked built on the questions the Lytherus readers asked, which she answers often because they are the ones people are most curious about. To not waste the precious time with her repeating herself, I decided to ask her things that were a little different. To watch or read one of those previous interviews, which answer a lot of basic questions about her life and he work, click here. In part one of the interview she talked a lot about her newest book, Reckless, so be warned: there are a few Reckless spoilers throughout. If you want to check out the interview, but are unfamiliar with her most recent work, click here to read the Lytherus review of Reckless. She dives into the fairy tale element in the stories, the geography of the Mirrorworld, her thoughts on series and keeping the books fresh, her unique writing style in Reckless, and more! LZ: Do you know for sure how many books are in the [Reckless] series? Cornelia: It lt looks like it will be five. You never know with a story, but that’s what it says at the moment, yes. LZ: You’ve mentioned [in previous interviews] how Inkheart was a stand-alone book originally, and then it became book two, and then book three. You started out form the beginning with Reckless to be a series. And then I was in Spain, in Barcelona and in Madrid, I did a conference with children where you go into the newspaper, and then children could call in and we did an i-chat. And they were like, “Oh the witches in Galicia are much different from the witch in Catalonia, you have to know all about them!” And I suddenly realized, oh my goodness, in Spain the folktales are very much alive, even much more than in Germany, where they are mostly in a polished version. So I thought, “Oh, I guess, the Spanish fairy tales are also very interesting, so maybe I have to change Jacob all around.” So yes, it does look like it will be a lot. I sometimes think this will be the world I will spend the rest of my writing life in. It is so multi-layered, that the first [book] was just a glimpse, and I start now exploring it. For example, I have finished the second draft of number two, and it is in Albion, which is England, and in Lorraine, which is France. And then it will go into Switzerland, so the world is expanding. You will see more; I’ve based all the world on the European lands of the 19th century. So I have the geographics, which makes it quite easy and it’s very nice. And what I do is I look at real places, let’s say, there’s a French town where they still have a myth about two giants. So I take that myth and I say, well, behind the mirror, the giants are real. So it’s much fun, that you almost play with saying, okay, in our world you sometimes get a glimpse of what’s on the other side. So for example when I read about Pittsburgh,there’s a crystal palace in Pittsburgh. LZ: I didn’t even know that! Cornelia: The stadium is called the Crystal Palace. A friend of mine is quite a famous basketball player and he said to me, “When you go to Pittsburgh, you know there’s a crystal palace.” And I was just writing about a crystal palace! So I was like, this is very strange. I looked it up and it is a staduim, but nevertheless, you could play with that. You could say, well, on the other side of the mirror, there may be a true crystal palace. So that is what I want to do more in the next books. LZ: Is the mirror going to lead to one [mythical] place? We’re not going to know it’s France, [the characters] are going to go and it’s going to be just that world you created? Cornelia: Well, in the first part it is New York. So, the mirror will stay in New York. So when Jacob goes out, he always ends up in that ruin that you met in the first [book]. But from there you will understand the geography of the world. So I am even counting the coach rides. How many miles, quite precisely, because I think then you will have fun following the travels. So if I say, okay, it takes them ten days to go to Paris from where the ruin is, or to Vienna is five days—Vena I based on Vienna, it is the old name for Vienna. It’s wonderful, I have a huge map in my writing house— I have a little writing house in my garden, , not so little, but yeah (laughs)—but there is a map, and I have little pins in all the places, and it gives you another kind of substance for the world, and I always wanted to write about Europe. LZ: So this is a chance for you to explore that, which is great. Going back to the question I asked a few minutes ago, knowing from the start that this book was going to be at least a trilogy, and now is five books, have you changed your mindset on multi-book series? I know your younger books are series, but I remember you saying specifically [regarding Inkheart], “Oh, I don’t want it to be a trilogy, there are too many trilogies, this is cliché to do,” but now you’re setting out for that. There are some stories who don’t ask for more, so it may still happen. For example, I will publish a book next year called Ghost Knight, and that’s one story and I would never say, okay, there has to be more. It’s always possible; I write my books always like that, that the reader feels, oh I could tell that story on. Because we all know from life, no story ends, right? So there are stand-alone stories, and then you suddenly enter a maze. And you suddenly feel, oh my goodness, this is a labyrinth, and you will get lost in it for ages. And then I think you should not back away from it, you should say that’s it. And also, I’m 52 by now,and you feel like, okay, I have this world now, I love this world, why should I do another and another and another. Let’s see how deep I can get with this one. LZ: And that makes sense. As a reader, the reason we read, the reason we escape into books is we feel connected, and if you love a character, you don’t want to see them end. You want to know and be with them for a long time. I’m a fan of series because I can’t wait. Cornelia: You know, you have to make sure the books don’t go stale. I always say to myself, as long as I am sure the next part is better than the part before, I keep on writing. If you feel you get bored with the character or the world, you feel you have told the stories about the world. So for the Ink world, I felt, okay, for now I told it. It can always happen that you go back, for another character, for another story line, but for now, you told it. I think that you have to follow that, and not say, okay, the readers want another one. I had that once with a series in Germany, where the readers went mad when I stopped it. It’s a reality series called The Wild Chicks. It’s just published in English in England. After five books, and every single book I didn’t want to do, the readers said, “please, Cornelia, make the world a better place, write another Wild Chick book.” So you continue, and after a while I said no, it’s not the world I want to be in. At the moment another author writes other parts of it, but not under my name, under his name, because the kids were so hungry for it that I said okay, I will not block the characters. If you want more stories, I’ll allow somebody else to continue, but it will not be me, and it will be very clear on the book that it’s not me. Cornelia: We just did a story competition on my website, which was so overwhelming, the quality of what the children sent. Well, not only children, also grown-ups. But we could not even give one award per language. I have a Spanish, an English, and a German website, and we will give nine awards to English language stories, five to German, and two or three to Spanish. It was so interesting for me to read which characters did the kids love most, which aspect of the world interested them the most. And I was not surprised by much, because I have forseen it. For example, Fox [from Reckless] will be one of the main favorite characters, but nevertheless, it was very interesting how much they loved the Goyl. I had hoped that, but there were many who did also switch into the stone skin. It was very interesting. Because it’s an outcast thing. Therefore, every encounter with readers makes you aware of another aspect of the story, or they ask you a question which you didn’t think about, or they point out something about your character that you didn’t see. I also love to get doodles or a collage, or visual material, and we are working at the moment massively on my website to make it more communicative, so that I see more what the readers do and what they are interested in. Because I write for my readers. And there have been times, for example, with The Wild Chicks, I once had an idea from a child which I took. I wrote her and I said, can I use it, and I used it for one of the books. Normally of course you follow the story and the story has its own way, but it’s very interesting to me, to communicate like that. LZ: The writing style in Reckless was so much different than the Inkheart trilogy. I even actually opened up the first Ink book last night to make sure I wasn’t going crazy. [Reckless] is very abrupt, succinct descriptions and in your face. Why did you choose that? Obviously we know it was as deliberate choice as a writer. Cornelia: When I was editing Inkdeath, I felt something inside, like, yeah, I’m kind of tired of this style now. I did it, that was for that world, a baroque, medieval world that needs that kind of language, and I felt at the end of it that I wanted to try something new. I always try something new. The Thief Lord is different from Dragon Rider, and Dragon Rider is different from the Ink books. So, I thought, well, what can I do? And then when I started working on Reckless, it was the first book that I worked on with somebody, one of my best friends [Lionel Wigram], and of course I warned him, I said Lionel, you will get all the blame for everything that I do now differently , they will blame you. That’s great (laughs) !You’re a movie person so they will say, oh, he did make her do that, and he was like “Are you sure?”, and I was like yes, I’m sure, you’ll see! But the thing is, of course he has no influence on my style. We talked plot, we talked characters, and we just did that for the second [book] again. But I am the writer, so it was Jacob’s fault, because he’s so impatient. He’s so thoughtless, he’s so on the move, that to do that tapestry language is almost impossible with him. He’s like running away when you do that. He’s much more modern. He’s a New Yorker. He’s someone with European origins, like I am, but he’s American too. And I wanted to capture that. The second book will probably get a little closer again to the older style because now I’m in the world, he calms down a bit, he doesn’t have to save his brother in the second book, he only has to save himself. I will try to keep it though because I think for this hero I need another language. It will not be right, and also it’s a more modern world, it’s a 19th century world, that tastes like ours already, and I felt I needed that in the language. What’s very interesting is that when I got the competition stories, they had changed their style. That was the most amazing thing. You look at it, and you have two or three kids that wrote like the Ink world. And then there were four or five who were doing the Reckless kind of language, and to me it was so fascinating, that they took it like a new tool box; let’s play with it, let’s see how it expresses your feelings. Because it would do something else. 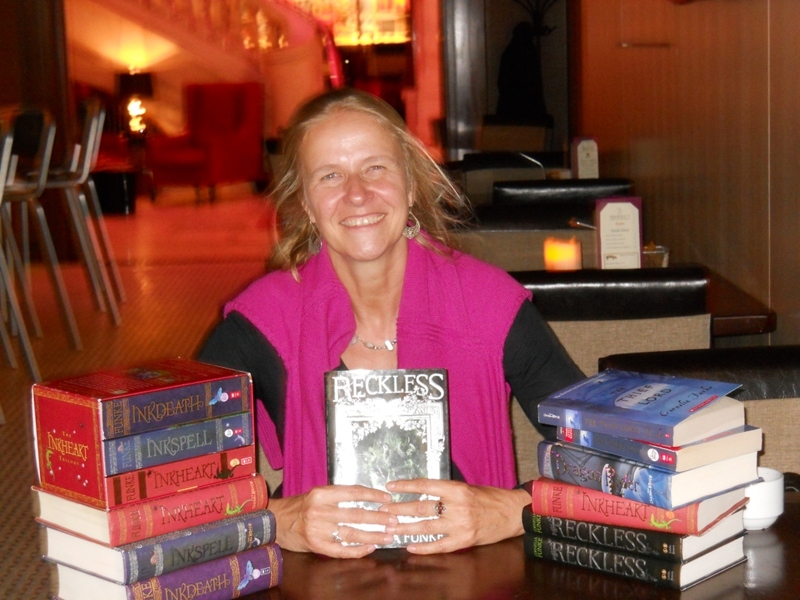 I have a wonderful audiobook reader in Germany, for fourteen years I have done all my stage events with him and he reads all my audiobooks, and said to me Reckless is like a pop-up book. Every sentence, you pop it, and a whole world comes out. But you have to pop it. You have to look. So in the first chapter when it says Jacob takes the key for the room of his father out of his mother’s drawer, and it lies next to the pills that make her sleep, of course you can read over that, and you don’t look at it. You can also say wht can’t she sleep? So, I try to do that, and it’s a more mature writing. I always said for the younger ones, Reckless will be difficult, because I tried something that is, let’s say, more older literature. LZ: There’s a lot of subtext there. Cornelia: Exactly. But the funny thing is, the younger ones didn’t have a problem. Because they are fast, so in a way I had ten or twelve-year-olds, and I said, “You shouldn’t read Reckless yet,” and they said, “ha, I read it three times, it’s fine.” (laughs). Okay, okay, whatever you want to do! So it’s interesting and they take other layers. Like for example the relationships between Jacob and Will and Clara are more mature. They are also more twisted, more difficult. In Inkheart the emotions are clear… well, Dustfinger isn’t very clear. LZ: But he’s kind of the exception in that world, whereas Reckless is the exception, the whole world. In the next parts now I will do more description, because so many readers said, “Yes, but please, give us more description!”And I respect that. But I want to try to nevertheless keep that style. So I will try my best, to write faster and more mature in the writing, but on the other hand give a little bit more description. LZ: I don’t feel like your decription was lacking though. Cornelia: I don’t think so! LZ: The first scene that pops into my head is with the unicorns. You’re wondering about Jacob’s scars, and they are not these pretty white things, but are actually these monsters, sort of. I mean, they’re pretty, but they mauled him, you know? You didn’t go into this huge long description, but it was just enough,bursts of image. Cornelia: That’s good to know. When you write yourself, you can see how liberating that is. If you can catch one phrase, it is much more intense. And I have to say, I decided this, but Lionel was such a big help, because he comes from script, so he’s used to melting things down. So when I sometimes had a description he read it and said, “Cornelia, if the moon reflects one more time in a pond, I’ll go crazy!” (laughs). And I was like, oh, sorry, and I cut it out. Because you have your cliches, you know? I just read a chapter before I came down [for the interview], I’m polishing, and I was like, oh God, there you did it again! And then you cut your cliches. And he was very good at that, because if you only do that in your head, it’s much more exhausting than having somebody sit next to you whom you can discuss it with. In part two, coming Wednesday, Cornelia talks about creating with her friend Lionel, her thoughts on Neil Gaiman and Guillermo del toro, writing with another author, George R. R. Martin’s fantasy style, and more. Be sure to join us then! Previous postGaiman’s American Gods coming to HBO?